StandardAero is closing Dallas-based Associated Air Center at the end of the year, citing a challenging market for private airliner completions. Associated Air Center (AAC), a pioneer in the VIP airliner completions business, is closing at the end of this year, just shy of its 70th anniversary. AAC parent StandardAero announced the plans late yesterday, saying current and future volumes of work aren’t sufficient to support the costs necessary to run the facility. StandardAero made “multiple attempts to sell the business” before coming to the decision to shutter it altogether, the company said. “After a thorough analysis, StandardAero has concluded that the business case for continuing to operate AAC is no longer an economically viable option for the company and its investors,” StandardAero said. “The limited pipeline for new business opportunities, excess industry capacity and slowing demands in the VVIP aircraft marketplace have all contributed to this decision.” The move, StandardAero added, is in line with its near-term growth plans to expand the group’s core engine MRO capabilities. StandardAero plans to help the approximately 170 AAC employees find positions within its other business units or provide “a variety of company-funded redeployment and outplacement assistance and services,” the company said. Meanwhile, the Dallas-based facility will either be leased or sublet by the end of the year and the assets will be sold or otherwise disposed of before then. The company maintains it will continue business as usual as it completes existing contract obligations, warranty services and ongoing projects. Employees will be retained as necessary to complete this work over the next few months. The remaining work primarily involves warranty and MRO services, with no full completions projects ongoing. The decision comes as the VIP airliner market has experienced a lull in recent years, with Airbus Corporate Jets delivering only one aircraft since the beginning of 2016 and Boeing Business Jets handing over seven VIP variants in that same time, according to General Aviation Manufacturers Association data. This compares with the four ACJ variants and 11 BBJ variants delivered in 2015 alone. Both Airbus and Boeing, meanwhile, are in the midst of a transition to “neo” and “Max” variants, respectively, of their traditional lines. While AAC has historically been a dominant player in the market, the VIP airliner completion business has become increasingly competitive, with companies such as Lufthansa Technik, GDC, Jet Aviation, Greenpoint, AMAC Aerospace, ST Aerospace, Comlux and Aloft AeroArchitecture all fighting for the limited market. The competition is so great that, in late December, Airbus also revealed plans to exit the VIP completion business this year, refocusing its Airbus Corporate Jet Center in Toulouse from ACJ completions to upgrades for its commercial airliners. For AAC, the move marks the end of an era. The company opened its hangar at Dallas Love field in 1948, originally as a three-man operation to install surplus radio equipment into former military aircraft. Over the years it evolved into more expansive MRO capabilities of large transport aircraft and in 1978 completed its first VIP conversions on two Boeings for the President of Mexico. The first widebody completion, a Boeing 747 SP, followed in 1998. In addition to being among the pioneers of VIP airliner completions, the center also played a role in the introduction of EFIS, forward-looking radar, EGPWS, TCAS and satellite communications in large transport aircraft modifications. The decision to close the business comes a little more than two years after investment firm Veritas Capital acquired StandardAero from Dubai Aerospace Enterprise (DAE) for $2.1 billion. 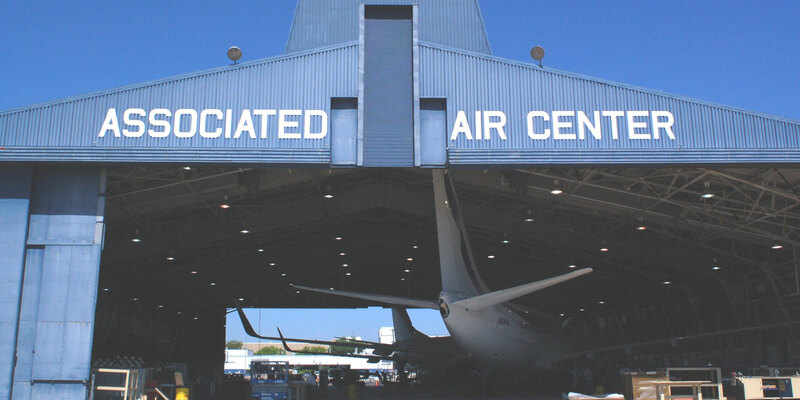 Associated Air Center came under the StandardAero umbrella through a series of acquisitions and mergers involving Piedmont Hawthorne, The Carlyle Group and then DAE beginning in June 2000. These mergers also involved the Garrett Aviation chain, as well as the original StandardAero brands. As each entity merged and was rebranded, the Associated Air Center name was so well established that executives opted to preserve it.